Our organisations are flooded with empty talk. We are constantly "going forward" to lands of "deliverables", stopping off on the "journey" to "drill down" into "best practice". Being an expert at using management speak has become more important in corporate life than creating long lasting results. The upshot is that meaningless corporate jargon is killing our organisations. Business Bullsh*t (Routledge), a new book by Cass Business School management expert, Professor André Spicer, argues we need to call out this empty talk for what it is. The book examines how organisations have become vast machines for manufacturing, distributing and consuming management jargon and follows how this meaningless language has spread through schools, NGOs, politics and the media. The book shows you how to spot pointless business jargon, considers why it is so popular, and outlines the impact it has on organisations and the people who work there. It also suggests what we can do to minimise it at work, making a case for why organisations need to avoid empty talk and reconnect with core activities. This provocative, lucid book is essential reading for professionals, researchers and managers. 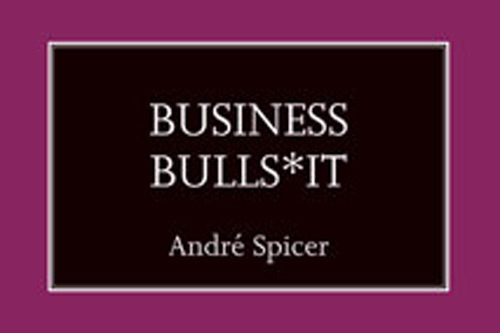 Business Bullsh*t is published by Routledge. More details here.